To bring more of Pittsburgh's talented musicians into local healthcare settings. Brings professional, personable, and service-minded musicians into Pittsburgh nursing and personal care homes. Provides an online roster of musicians and their bios so that project activity directors have a greater breadth of musicians to choose from to perform for their residents. Informs MWAM musicians of performance opportunities through regular e-mails listing requests from our healthcare partners. 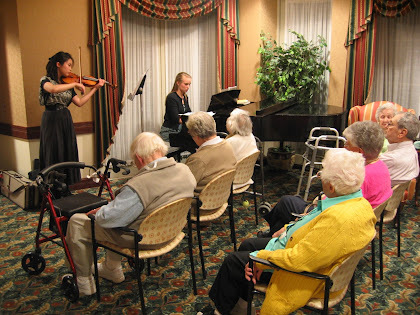 Assists musicians in preparing programs that are meaningful and engaging for the elderly. People are living longer than ever before, but what about their quality of life? Among older individuals, music can provide meaningful stimulation and enjoyment and thereby help to reduce chronic pain and stress. Additionally, multiple studies over the past decade have shown music to work across a person's lifespan to develop, protect, and even repair the brain. Music has been shown to be effective in the treatment of Parkinson's Disease, Alzheimer's, dementia, and depression. For professional and student musicians who spend hours a day in a practice “cell”, it can be easy to lose sight of the goal: the one-on-one connection with the audience, the ability to touch someone through a performance. An additional benefit to the musician is the valuable performance experience gained in a setting that is more relaxed than other performance and auditioning venues. Musicians With A Mission seeks to take two groups of people that often spend significant time in isolation – musicians and the elderly – and encourage them to enjoy mutual companionship in the context of great music. Copyright Musicians With A Mission. All Rights Reserved.